Growing evidence suggests an association between active cigarette smoking and increased breast cancer risk. However, the weak magnitude of association and conflicting results have yielded uncertainty and it is unknown whether associations differ by breast cancer subtype. Using population-based case–control data from phases I and II of the Carolina Breast Cancer Study, we examined associations between self-reported measures of smoking and risk of Luminal and Basal-like breast cancers. We used logistic regression models to estimate case–control odds ratios (OR) and 95 % confidence intervals (CI). 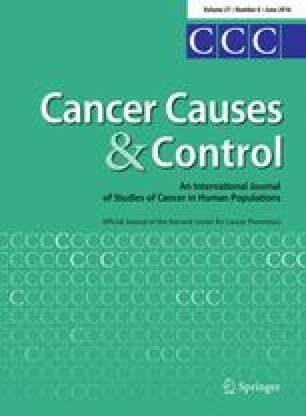 Ever smoking (current and former) was associated with a weakly increased risk of Luminal breast cancer (OR 1.12, 95 % CI 0.92–1.36) and was not associated with risk of Basal-like breast cancer (OR 0.96, 95 % CI 0.69–1.32). Similarly, smoking duration of more than 20 years was associated with increased risk of Luminal (OR 1.51, 95 % CI 1.19–1.93), but not Basal-like breast cancer (OR 0.90, 95 % CI 0.57–1.43). When stratified by race, elevated odds ratios between smoking and Luminal breast cancer risk were found among black women across multiple exposure measures (ever smoking, duration, and dose); conversely, among white women odds ratios were attenuated or null. Results from our study demonstrate a positive association between smoking and Luminal breast cancer risk, particularly among black women and women with long smoking histories. Addressing breast cancer heterogeneity in studies of smoking and breast cancer risk may elucidate associations masked in prior studies. This work was supported by the North Carolina University Cancer Research Fund, a Grant from the Komen Foundation, and a National Cancer Institute Specialized Program of Research Excellence Grant, P50-CA058223.